It has been a while since any of my posts have been baby related, but I thought I would bring you one of my favourite recent discoveries today. Baby Green has just turned seven months old and we have been on our weaning journey for a few weeks now. She has been tucking in to all sorts of finger foods, most of it does go on the floor, I think that is a given at this age, but she is surprisingly coordinated when she wants to be. 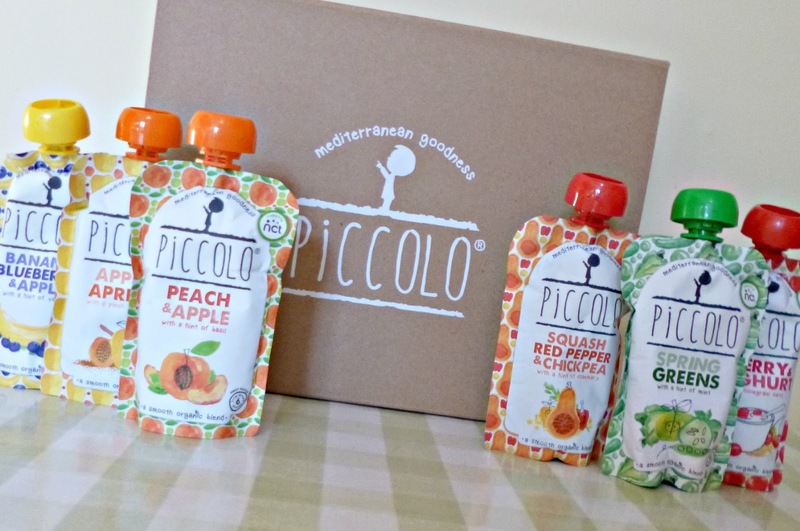 Although I love to feed both of my children home cooked meals and can’t wait until she able to join us more often at the table, for her first tastes we were delighted to discover the lovely new baby food brand Piccolo. Piccolo is a brand making tasty organic food based around Mediterranean flavours. Being half Spanish, this very much appealed to me. I feel there are so many advantages to the way they approach food in other European countries. As a child and teenager I enjoyed large family gatherings where the table would be full of tasty food to share and try. Food is more than just nourishment it is a social event, it marks happy occasions and brings people closer together. In Spain after the baby stage has passed they don’t tend to have separate children’s food or menu’s, instead children are encouraged to sit at the table with the family and eat what the grown ups do and this is a principle that is really important to us a family. Baby Green’s older brother is eight and enjoys a wide variety of foods so I know this approach to weaning works well. 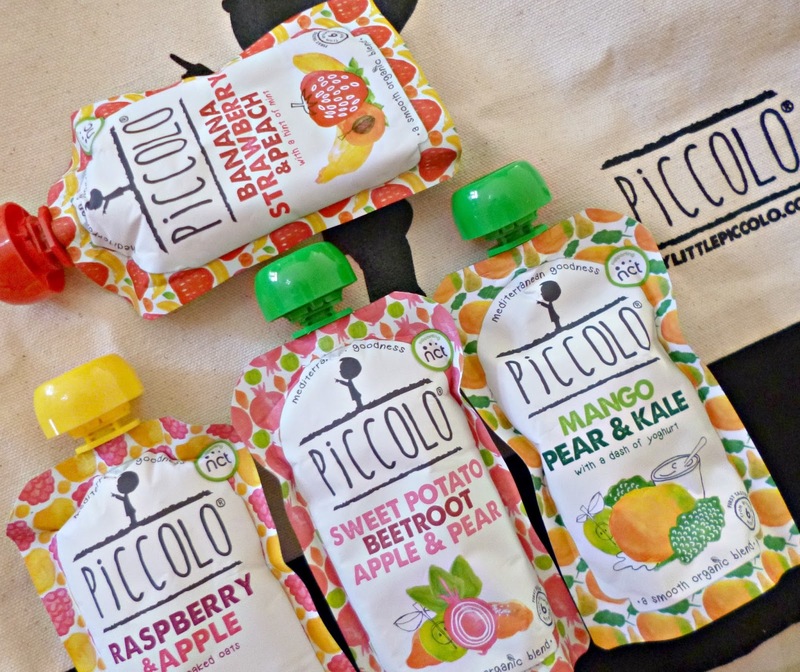 Having tried several other brands of baby food and knowing that the flavours and textures just weren’t what we appreciate as a family, Piccolo was a breath of fresh air. The fantastic recipes have a great variety of flavours that Baby Green loves and come in smooth stage one blends and newly launched stage two pouches. We loved the blends of fruit and vegetables, we encourage Baby Green to feed herself with a pre-loaded spoon and she shows real enjoyment of food already, you can always tell when she isn’t impressed with a flavour as she will simply not open her mouth, which is what she has done with every other brand except Piccolo! I love having these pouches as a standby in the cupboard for those days when we might be running a little late with tea or she needs something nutritious fast. They are also fantastic for popping in the change bag when heading out the for the day, really convenient. So far her favourite flavours have been the more savoury ones such as Squash, Red Pepper and chickpea and Spring Greens with a hint of mint, but she also really loves Peach and apple for pudding or for breakfast. Knowing these are made with all natural ingredients and no additives gives me peace of mind too. I love that Piccolo incorporate some of our favourite flavours as a family in it’s recipes such as Kale and Beetroot, the taste and variety beats any other brand we have tried and have been a really big hit. The only downside to using these pouches is that obviously they aren’t the best for a zero waste lifestyle. As we use cloth nappies and wipes and create very little waste as a family this is a compromise I am willing to make. Although you can’t put baby food pouches in your kerbside recycling (as they are difficult to recycle), I keep mine and send them off to a charity such as Count the Kicks who will make some money from them, so they don’t go to landfill. I did approach Piccolo on the issue of packaging and they told me it was something that was important to them and were working on solutions so watch this space! Piccolo have partnered with the NCT to donate 10% of the brands profits to food education, always nice to see a brand giving back. They have just this week launched some new Stage two blends, so look out for my thoughts on those coming soon. You can shop the delicious flavours in Asda, Waitrose Abel and Cole and Planet Organic. Find a stockist near you at www.mylittlepiccolo.com.